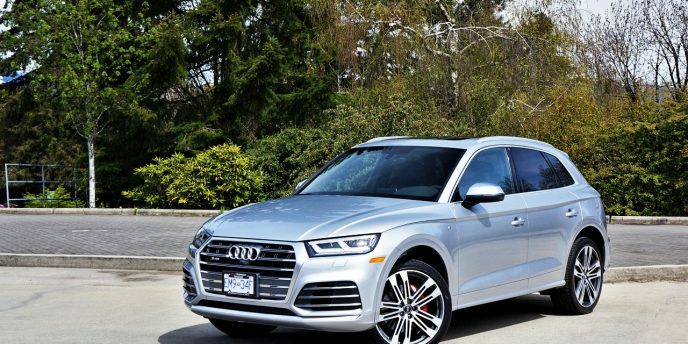 When Audi’s Q3 showed up on the Canadian subcompact luxury SUV scene in 2014 for the 2015 model year it was already old news in other parts of the world. It had originally launched as a 2012 model in Europe, so the heavily refreshed 2016 version that soon replaced the first-generation Q3 was a complete surprise for many when it arrived in late 2015. That mid-cycle update ushered in a new look for Audi SUVs on the whole. Its equiangular hexagonal singleframe grille grew broader and more sharply edged, with new satin-silver exterior trim for a more sophisticated look. Its headlamps received some subtle revisions too, while a new aluminum hood with reworked sculpting sat overtop, and the lower apron received some minor updates too, depending on trim. Other small updates to the rocker panels and rear bumper cap let aficionados know which model they were looking at no matter the direction of view, but for the rest of us it was the grille up front that made the 2016 Q3 look entirely new. Now, three more years into what is effectively a seven-year model run has the current Q3 showing its age, so this completely redesigned second-generation Q3 will be a much needed breath of fresh air for Audi retailers and fans of the little utility, many of which have been patiently waiting for a redo before upgrading. Audi introduced the new and improved 2019 Q3 online over the summer and in the metal at the Paris Motor Show last month, and it’s expected to go on sale during the second quarter of next year. Larger than its predecessor and therefore getting closer to true compact status, the new Q3 rides on parent company Volkswagen group’s MQB platform architecture that also underpins the namesake brand’s much improved Tiguan. 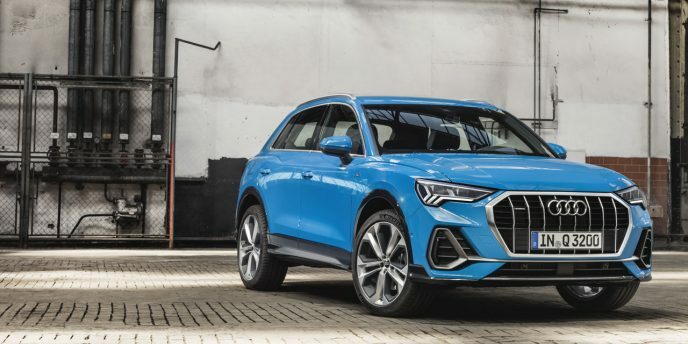 To put it in perspective, with a 4,485-mm (176.6-inch) overall length the new 2019 Q3 is 97 mm (3.8 inches) longer than the outgoing model from nose to tail, with a 77-mm (3.0-inch) longer wheelbase that now measures 2,680 mm (105.5 inches). It’s also gained 25 mm (an inch) in width, now spanning 1,856 mm (73.1 inches) from side-to-side, while the new model’s 1,585-mm (62.4-inch) height means that it’s shrunk by 5 mm (0.2 inches) compared to the old Q3. Sidle the new Q3 next to the new Tiguan and you’ll find it’s almost identical in length and wheelbase, albeit only when compared against the short-wheelbase VW offered in Europe. The long-wheelbase version we get here is a significant 227 mm (8.9 inches) longer than the new Q3, with 111 mm (4.4 inches) more distance between the axles, but the Q3 is 17 mm (0.7 inches) wider and interestingly 88 mm (3.4 inches) lower overall. This should give the Q3 a sportier stance, thus leaving the Tiguan to more practical utility duties. Of course, Q3 buyers wouldn’t normally be shopping the little Audi against the Tiguan or any other mainstream volume branded SUV, but instead other subcompact luxury SUVs, but how has its increased size placed it amongst its premium peers? The list of subcompact luxury SUVs is long and ever-increasing, with longstanding models like BMW’s X1, Mercedes-Benz’ GLA, Range Rover’s Evoque and Mini’s Countryman more recently joined by Infiniti’s QX30, Jaguar’s E-Pace and Volvo’s XC40, with Lexus’ new UX getting ready to enter the fray next year and Acura recently teasing North American buyers with its China-only CDX. Without going into too much detail, the new Q3 is currently the longest in its class, but will soon be outflanked by the new UX. Its right in the middle with respect to wheelbase length and width, however, while its roofline is lower than class average. So Audi has taken one of the smaller utilities in the class and made it one of the largest, and therefore potentially opened the door to a future Q1. Rather than climb down that rabbit hole, more Canadians will be happier to know the new Q3 has grown as much inside as it has outwardly. For instance, the longer wheelbase translates into more rear legroom, while the rear seats are capable of moving a full 150 mm (5.9 inches) back and forth. What’s more, the rear bench is now fully split in the most convenient 40/20/40 configuration, instead of just 60/40 with a centre pass-through like the previous model. This means there’s more space down the middle to fit longer items like skis when the rear outboard seats are in use, and those rear backrests are even more comfortable thanks to a recline function that can be tilted in seven increments. Back to those skis, you might be able to fit the kids’ boards diagonally in the back thanks to 57 more litres of cargo space behind the rear seatbacks, the new total amounting to 530 litres (18.7 cubic feet), while 160 additional litres of gear-toting room can be had when the rear seatbacks are laid flat for a new maximum of 1,525 litres (53.9 cubic feet). Aiding flexibility, a new removable loading floor can be repositioned in three levels, while the parcel shelf can be stowed beneath the floor when not in use. Lastly, a powered liftgate with “kicking motion” gesture control access is optional. Audi hasn’t revealed standard and optional Canadian-specification information yet, but they have announced that a 10.25-inch version of their Audi Virtual Cockpit will be standard across the line in all markets, which will be a big bonus being that similar digital primary gauge clusters are normally pricey options if available from the competition at all—currently the Volvo XC40 is the only rival to offer one as standard kit. As per usual it operates via steering wheel controls, while when upgrading to a higher trim grade featuring optional MMI navigation plus the Virtual Cockpit comes in a larger 12.3-inch form that allows digital mapping, plus other functions, to appear larger in the more configurable multi-information portion of the display, between the speedometer and tachometer. The optional display also includes three different views, featuring new performance graphics that Audi promises to be “particularly sporty”. In fact, the Q3’s new voice control is said to understand “freely structured wording,” which means it should respond to voice prompts like a modern-day smartphone. According to Audi, the dialog manager can even ask questions if required, plus it “allows corrections, offers choices and defers to the speaker when interrupted.” Now if Audi could only make the front seat passenger so cooperative. Additionally, top-tier Q3 trims get an infotainment system with new LTE Advanced standard connectivity featuring a Wi-Fi hotspot, while the navigation interface remembers preferences from previous journeys and then provides possible route suggestions. Audi connect also uses real-time traffic information when guiding via navigation, while point-of-interest searches plus parking space and filling station info appears directly in the map. Regarding the search for that illusive parking spot, the new Q3 actually uses swarm intelligence to forecast the availability of roadside parking spaces, plus it also provides info on road hazards and speed limits. Additional options will include Google Earth and hybrid radio, which automatically switches between FM, DAB and online streaming to provide the best reception possible. What’s more, the myAudi app lets you to connect your smartphone to the Q3, so you can transfer your schedule via a calendar app and any pre-organized navigation routes to the car’s MMI infotainment system, or even locate where your Q3 is parked. Speaking of phone connectivity, the Audi phone box inductively charges the owner’s smartphone through the Q3’s antenna, while the Audi smartphone interface lets said smartphones link to the MMI display via Apple CarPlay or Android Auto. Of course, Bluetooth phone connectivity with audio streaming will come standard, but you’ll need to pay extra for the top-line Bang & Olufsen premium audio system that provides three-dimensional virtual sound via 15 speakers including a subwoofer. What’s more, the Q3’s four 360-degree cameras, which display on the infotainment touchscreen, make it easier to manoeuver in tight surroundings like parking lots. Even better, when using the available park assist semi-autonomous parking system the Q3’s driver only needs to watch the proceedings on the screen while shifting into the correct gear, applying the throttle, and stepping on the brake when necessary, while the car automatically steers itself in and out of parking spaces. Audi also offers cross traffic assist to warn of oncoming vehicles when reversing out of a parking space, while lane change warning is also part of this suite of safety features. Along with interior styling that’s much more dramatic, delivering a true sense of occasion even in this more price-sensitive entry-level luxury class, not to mention interior fit, finish and materials quality that should be a considerable upgrade over the previous Q3, especially if we receive the same two-tone suede-like Alcantara dash, armrest and seat trim being offered to Europeans, Audi also promises an ergonomically designed cabin, which is a claim that’s certainly consistent with its latest offerings. This means that “all displays, buttons and controls” are within easy reach and logically laid out for intuitive operation, while the steering wheel is “steeply angled” to coincide with the “sporty”, albeit “comfortable” driver’s seat. The outgoing Q3’s driver’s seat delivered a nicely raised view to the road ahead with good visibility all-round, important being that the sense of control that comes as part of this commanding driving position is a key reason that SUVs have become so popular. The new model will continue with its similarly raised profile, while also providing some very real performance improvements to enhance the overall driving experience. This will be critical to the new Q3’s success, being that a weakness of the outgoing model was its one-size-fits-all 2.0-litre turbocharged powertrain that made 200 horsepower and 207 lb-ft of torque. Such output is quite reasonable for a base engine, yet when put up against some of its competitors’ upgraded powerplant options it was a tad underwhelming. Therefore, the Canadian-spec Q3 will be available with a new 2.0-litre turbocharged and direct injected four-cylinder making 190 horsepower and 236 lb-ft of torque in base trim, while a new 230 horsepower variant of the same four-cylinder engine with 258 lb-ft of torque will also be available. Likewise, six-speed manual, “fast-shifting” seven-speed dual-clutch S tronic automated, and eight-speed automatic transmissions will be on offer, but likely only the latter, which adds two more gears over the outgoing Q3’s six-speed Tiptronic automatic, will make it here, with permanent Haldex-type Quattro all-wheel drive as standard equipment, a marked change from the outgoing Q3 that offered Quattro as an upgrade to a base FWD layout. Audi says the Q3’s new hill descent control will maintain a preset speed on steep downhill gradients by simply pushing a button, which should aid the model’s off-road capability. Back on the street, the new Q3 will sport an upgraded Audi drive select with a total of six profiles, from “markedly comfortable, highly efficient through to out-and-out sporty.” Audi drive select can also enhance the suspension with adjustable damper control when equipped, which uses sensors to “measure the movements of all four wheels as well as the vehicle’s lateral and longitudinal acceleration,” before automatically making adjustments. Alternatively, the S line exterior package includes a sport suspension that provides more progressive steering tuning with a more direct feel via increased steering angle, while it firms up the Q3’s springs and dampers too. Previously, steering wheel-mounted paddle shifters were also added as part of the upgraded sport package, but we’ll need to wait and see what Audi has in store for our Canadian-spec model. We also won’t know about the 2019 Q3’s fuel economy until closer to its arrival, but if it’s anywhere close to the current model’s 11.9 L/100km city, 8.4 highway and 10.3 combined AWD rating, it will be very competitive. Lastly, the new model is arguably better looking too, with its most striking feature a new equiangular octagon grille, adding two more sides to Audi’s now trademark singleframe design. We first saw this with the new Q8 four-door crossover/coupe, and it’s also appeared in various Q2, Q4 and Q6 renderings and concepts, so we can feel pretty confident it’s the new face of Audi SUVs, at least. 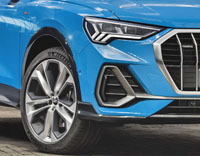 All of the new cars still feature versions of the now classic six-sided grille, albeit featuring sharper edging with each new model, but this new ovoid look is appealing within the brand’s crossover SUV lineup, giving the Q3 distinctive character. The new grille gets divided up with vertical bars and large air inlets, the look made more dramatic when opting for the aforementioned S line exterior package that brightens the vertical strakes with aluminized highlights, or alternatively with available glossy black and dark grey trim. Moving up to the S line also enhances the lower front fascia with unique floating satin-silver detailing within deeper cut corner vents, and then pulls the brightwork inward with a horizontal metallic strip. 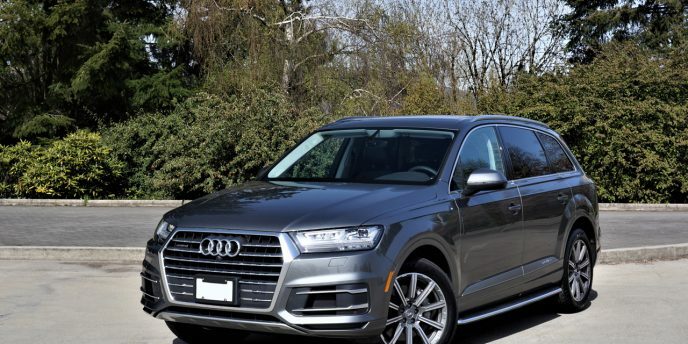 There’s much more to the S line exterior package than that, making it a good choice for those who want their Q3 to stand out in the subcompact luxury SUV crowd. Depending on trim, the Q3’s narrow headlamps can be fitted with one of three lighting sources, topped off with Matrix LED technology and adaptive high beams. We’ll know more about all of these details when the 2019 Audi Q3 goes on sale next year, but until then enjoy our photo gallery above and video below. The more popular SUVs continue to become, the more likely we’ll be seeing ever varying adaptations on their sport and utility themes. Some automakers will break from the status quo by providing ultimately capable off-roaders that take to the hills like their forebears could never have dreamed, while others will come equipped with new levels of roadworthiness, as adept at managing the track as their upright, five-door body styles are capable of swallowing up family and cargo. The Audi SQ5 fits into the latter mould. The word mould might not be the ideal descriptor, mind you, being that very few SUVs even come close to measuring up to the wonderfully quick and superbly agile SQ5. In fact, maybe a handful within the compact luxury segment could be called competitors at all, these including the 355 horsepower BMW X3 M40i, the 360 horsepower Porsche Macan GTS, the 362 horsepower Mercedes-AMG GLC 43, the 380 horsepower Jaguar F-Pace S, the Jag’s familial Range Rover Velar with its version of the same 380 horsepower supercharged 3.0-litre V6, and the 400 horsepower Macan Turbo, while the 440 horsepower Performance Package version of the same Porsche Macan Turbo, the 503 horsepower AMG GLC 63 S version of the Mercedes SUV, and the 550 horsepower SVR version of the aforementioned Jaguar are in another class altogether. A humbling assortment of super-SUVs? Considering the SQ5’s 354 horsepower is the lowest output in this rarified group, one might think so. Still, it comes down to performance at a price, and the $61,300 SQ5’s sizeable 369 lb-ft of torque allows it to sprint to 100km/h in just 5.3 seconds and on to a speed limited 250 km/h that neither of us will likely ever experience. It’ll cost you just $200 more to slice 0.5 seconds off that zero to 100km/h time with the just noted X3 M40i that makes an identical torque figure, while strangely the $1,200 pricier GLC 43’s more robust 384 lb-ft of torque only results in 4.9 seconds to 100km/h, but it’s still quicker than the SQ5. Despite a much loftier price of $76,000 the Macan GTS is probably the closest performance match to the SQ5 at 5.2 seconds to 100km/h, but the same model in even pricier $87,200 Turbo trim chops the sprint time to 4.8 seconds, whereas the $69,900 V6-powered F-Pace is left slightly behind at 5.5 seconds to 100km/h, and the identically powered and priced Velar is good for 5.7 seconds. All prices can be found at CarCostCanada, by the way, plus rebate info and dealer invoice pricing that could save you thousands. A noteworthy alternative is the new Alfa Romeo Stelvio that manages a cracking 5.4-second sprint to 100km/h and 232 km/h top speed despite only offering 280 horsepower and 306 lb-ft of torque from its 2.0-litre turbocharged four, while the new $95,000 Stelvio Quadrifoglio will soon be tied with the AMG GLC 63 for fastest in the class due to a zero to 100km/h run of just 3.8 seconds and top speed of 285 km/h, its twin-turbo 2.9-litre V6 making a significant 505 horsepower and 443 lb-ft of torque. Considering the Stelvio comes from the global automaker responsible for the 707-horsepower Jeep Cherokee SRT Hellcat, why should we expect anything less? As for those other super beasts, the $99,000 upgraded Macan Turbo does the deed in 4.4 seconds, Jag’s hyper-fast $89,900 SVR is rated at 4.3 seconds, and Merc’s outrageous $90,500 GLC 63 is, as already noted, now tied for the segment’s quickest SUV at just 3.8 seconds to 100km/h. As it’s easy to see, the more you pay the more you get, for the most part, yet the SQ5 delivers a potent dose of straight-line performance for what is currently this compact super-SUV segment’s lowest price point. What’s more, if you were to build out each of these competitors you’d quickly learn that Audi’s value proposition grows commensurately as its rivals’ directly comparative pricing expands exponentially. Being that purchasing any one of the aforementioned SUVs is hardly a needs driven choice, the decision will come down to other factors as well, such as how all that performance translates into real-world driving capability, both when pushing the limits and when cruising down the highway or running around town, plus the usual personal taste issues like styling, interior design and execution, features, and general livability. Something could be said for heritage, with the four-ringed brand’s history dating back to the early 20th century, although these were complex beginnings that involved the merger of four brands to form one conglomerate in 1932, Auto Union AG being the latter and Audi, DKW, Horch, plus Wanderer making up the former four. In the end, Audi was the only name to survive after Volkswagen group acquired Auto Union from Daimler-Benz in the 1960s, and after some initial hiccups it has transformed into one of the most formidable players in the premium automotive sector. As for the SQ5, it has also shown endurance as the compact luxury SUV segment’s longest running performance model. It arrived in 2013 as a 2014 model, and has therefore been with us for six-plus years. The Macan hit the road the following year, while the M40i version of the X3, and the rest of these compact SUV power players, are relative newcomers. Something else the SQ5 has in its corner is a Q5 donor model that’s the segment’s number one seller, showing that in this class more luxury buyers prefer Audi when it comes to drivability and the multiple parameters previously mentioned, including styling, interior design and execution, features, and overall functionality. Similar to the Q5, the SQ5 is an easy and enjoyable SUV to drive around town, wonderfully comfortable over smoothly paved roads and irregular patches of asphalt alike, albeit more stiffly sprung than its less sporting stable mate. This makes it superbly stable on the open highway, and especially so when the road narrows and starts to wind, where its sport sedan-like handling is much more capable than those on the more docile side of this category. Adding to its comfort quotient, well-designed sport seats support five occupants front to back, ample roominess surrounds, and driver ergonomics are especially good. As for styling, the Q5 is entirely new for 2018 so its design remains totally fresh, albeit heavily influenced by the smaller subcompact Q3 and larger mid-size Q7, not to mention other Audi models. This, of course, is a good thing, being that most find the brand’s lineup very attractive. 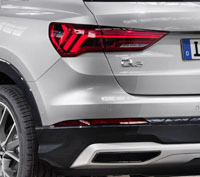 The SQ5 differentiates itself from the Q5 via new standard LED headlamps, bolder front grille strakes, the same horizontal aluminized slats on the front corner vents, which protrude lower and incorporate some nice new details as part of a revised front valance, some unique satin-silver trim up front, on the mirror caps and at back, modified side skirts spanning a sporty set of twinned five-spoke 20-inch alloys shod in 255/45 performance rubber, a longer rooftop spoiler, and a revised rear bumper cap incorporating visually extended side skirts at each corner and a new set of ovoid tailpipes at each end of what appears to be a completely open diffuser. Red and silver SQ5 badging finishes off the look, which is a nice visual step up from the regular Q5 overall, albeit not dramatically different. Back to the mechanicals under the SQ5’s svelte new sheetmetal, the 3.0-litre V6 engine’s aforementioned torque rating is 22 lb-ft greater than it was from 2014 through 2017, thanks to a new turbocharger that replaces the previous supercharger. All that extra twist is now available lower down the rev range too, arriving at only 1,370 rpm, which gives the updated 2018 SQ5 a noticeable improvement in response off the line. In fact, the SQ5 accelerates at a blisteringly quick rate accompanied by a wonderfully sonorous exhaust note that blips with each gear change for an adrenaline inducing auditory track, enhanced further when Audi drive select is set to Dynamic sport mode. The eight-speed automatic provides fairly quick paddle-prompted shifts, but it doesn’t flick through the gears with the type of precise action as Audi’s S-tronic dual-clutch gearbox. Still, each increment is smooth, which is a more suitable attribute for an SUV than anything too abrupt. I should mention the revised engine is 14 kilos (30.8 lbs) lighter too, which when combined with the new SQ5’s reduced weight helps to lessen curb weight by 35 kilograms (77.1 lbs) overall. Along with the obvious benefits to performance, the new SQ5’s trimmed girth aids fuel economy, with a 2018 rating of 12.7 L/100km in the city, 10.0 on the highway and 11.5 combined, compared to 14.1 city, 9.9 highway and 12.2 combined for the outgoing 2017 model. That’s a massive improvement considering both utilize similar eight-speed automatic transmissions with auto start/stop, and standard Quattro AWD. Features in mind, last year the SQ5 came in a top-tier Dynamic Edition with 21-inch alloys, performance tires and loads of premium kit that was otherwise optional, but this upgrade was discontinued for 2018 in place of the usual mid-range Progressiv and top-line Technik trim lines, plus a similar assortment of packages and standalone options. On that note the SQ5 Progressiv comes well equipped with the aforementioned full LED headlamps featuring automatic high beams, LED taillights with dynamic indicators, anodized metal-finish roof rails, proximity-sensing keyless access that includes a hands-free power tailgate, pushbutton ignition, an electromechanical parking brake, plus Audi drive select with Auto, Comfort, Offroad, Dynamic sport and Individual modes. Interior trim includes brushed aluminum inlays, while a special S-branded leather-wrapped multifunction heatable sport steering wheel with shift paddles, and heavily bolstered sport seats with gorgeous diamond stitched S-embossed Nappa leather upholstery continue the SQ5’s bespoke look and feel. Additional standard features include rain-sensing wipers, power-folding and auto-dimming side mirrors, an auto-dimming rearview mirror, a HomeLink garage door opener, heatable powered front seats with four-way powered lumbar and driver’s memory, tri-zone automatic climate control, an 8.3-inch MMI infotainment display with Apple CarPlay and Android Auto smartphone integration, the MMI touch control system on the lower console that includes a touchpad, rotating dial and quick-access button combination, Bluetooth phone connectivity with audio streaming, accurate navigation with detailed mapping, front and rear parking sensors, Audi’s music interface with USB connectivity, satellite radio, a powered panoramic sunroof featuring an opaque sunshade that still allows a bit of light through when closed, Audi pre sense basic that automatically closes all windows and the sunroof if sensing a potential accident, the usual allotment of active and passive safety features, plus more. My $65,900 Technik trimmed tester replaced the base model’s 7.0-inch colour multi-information display (MID) with the 12.3-inch Audi Virtual Cockpit, a fully digital instrument cluster that’s easily one of the industry’s best thanks to its ability to shrink down the primary gauges while simultaneously expanding the MID’s functions, the navigation mapping especially impressive when this “VIEW” mode is applied. Likewise, Technik trim improves on the base model’s backup camera with dynamic guidelines by adding a Bird’s Eye overhead 360-degre surround view, while this top-line model also replaces the base 10-speaker stereo with a fabulous sounding Bang & Olufsen 3D surround system, plus it adds custom colours to the standard ambient interior lighting, heated/cooled front cupholders, and heatable rear outboard seats. Technik trim also includes a number of advanced safety features like Audi pre sense rear that does everything pre sense basic does with a focus on potential rear collisions; the Audi side assist blindspot warning system; rear cross-traffic alert that warns of drive-by traffic when reversing out of a perpendicular parking spot or driveway; a new exit warning system that lets you know if a vehicle is approaching from behind when you’re parallel parked and opening your door to get out; plus Audi Connect Assistance and Security, which is a suite of entertainment and security-based services designed to enhance convenience, enjoyment and safety. By the way, all of the aforementioned safety systems and the surround camera are available in lesser Progressiv trim when opting for the $1,500 Driver Assistance package, while both trims offer a $1,100 Comfort Interior package with softer Milano leather upholstery, ventilated front seats, and rear side window sunshades. My tester didn’t include the latter, but its interior looked fabulous thanks to $900 worth of glossy Carbon Atlas inlays across the dash and door panels. Technik models go a step further by offering a $2,100 Advanced Driver Assistance package that includes adaptive cruise control with Stop and Go, Audi pre sense front autonomous emergency braking, Audi pre sense city, traffic sign recognition, Audi active lane assist, and traffic congestion assist. Also available, a $1,100 head-up display projects key information onto the windscreen ahead of the driver, while rear passengers can benefit from the added safety of side-impact airbags. Audi swapped out the regular 20-inch alloy wheels that come standard with both trims for set of $1,000 21-inch V-design alloys on 255/40 performance tires, which helped to dress up the exterior even further than the standard SQ5 while enhancing handling a little bit more. While great to look at, fabulous to drive and as beautifully finished inside as anything this class has to offer, the SQ5 remains as utile as the regular Q5. From its spacious and comfortable passenger compartment to a roomier than average 759-litre (26.8 cubic-foot) cargo capacity, which expands up to 1,710 litres (60.4 cu ft) by pulling on levers attached to each sidewall, the SQ5 doesn’t shortchange on space or fine attention to detail, like high-quality carpeting, webbed pockets, chromed tie-down rings, and a stunning brushed metal protector plate in the back. Even better, those rear seatbacks automatically drop either 60 or 40 percent, but take note that the left 60 is actually divided 40/20, which lets you unlock the centre portion to lay longer items like skis down the middle while rear passengers enjoy the more comfortable outboard window seats that, as noted, were heated on my tester as well. The 60/40 portions slide fore and aft plus recline too, so you won’t be hearing complaints about comfort from those in back. Truly, I can’t imagine anyone complaining about life with an SQ5, other than your significant other moaning expletives if they don’t get enough time behind the wheel. The truth is, as comfortable as the SQ5 is for passengers, you’ll want to be in the driver’s seat more often than not. That’s certainly how I felt. There may be faster performance SUVs on the market, but the new SQ5 might just be most well rounded option available, delivering bucket loads of speedy acceleration, a sonorous soundtrack of burbling exhaust notes, a superb handling and ride compromise, a gorgeous, comfortable and fully functional interior, plus enough features to even keep techies enthused well into the ownership cycle. I wholeheartedly recommend it. Consider the history of Audi here in North America. The four-ringed brand from Ingolstadt, Germany toiled in the shadows during its nascent years in the North American markets, with solid but relatively unknown models like the Audi 100 LS, Fox, and 5000. It was the 5000, totally redesigned in its third generation as an aerodynamic sedan that really began a sales trend for Audi. The 5000 was large, safe and technologically advanced. After all, the motto for the company for quite some time has been Vorsprung durch Technik (Progress through Technology), and the 5000 was technologically ahead of its time. And then the bottom fell out for Audi again, and for the VW Group as a whole, as the Group was accused of and admitted to goosing software to make their TDI cars and SUVs appear to be cleaner in Environmental Protection Agency Clean Air Act testing. After paying record fines and buying back many beloved TDI vehicles from owners, like the Audi Q7 TDI, the VW Group abandoned the diesel business here in the North America. Before the scandal, diesels represented 25 percent of all VW sales in the U.S. and an even greater number in Canada, plus a significant percentage of Audi sales. With the glamour and glitz of a Hollywood production, e-tron rolled into a packed warehouse on San Francisco Bay and “charged” the audience with the same type of hype and emotion of Mayweather/McGregor at the MGM in Vegas. One could say the match was Electric v. Gasoline, and it was quite a show. When the epic event was over and we got a chance to see e-tron up close, Audi’s motto rose from whatever ashes the diesel debacle left behind, as Vorsprung durch Technik is reborn with e-tron. 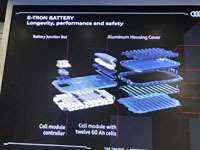 So what is e-tron? It’s a sport-ute styled like the Q5 and Q7 that will probably feature the brand’s usual trio of Komfort, Progressiv and Technik trim levels when details become known. In the U.S., where trims and pricing were announced as part of the San Francisco event, it comes in base Premium Plus trim starting at $74,800 USD, Prestige trim at $81,800 USD, and as the limited (999 units) “Edition One” starting at $86,700 USD. Premium Plus includes a 9.6kW AC home charger, Bang & Olufsen 3D sound system, Audi “phone box” wireless charger and signal booster, heated and ventilated leather seats, panoramic sunroof and integrated toll module. One super high tech feature Audi hopes will be standard equipment on the e-tron 55 quattro is side cameras to replace traditional sideview mirrors. 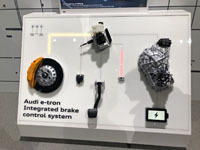 At a display I visited prior to the world debut called Audi Tech Park, all of e-tron’s super cool hardware was on exhibit, including the impressive high-definition sideview cameras. Audi is awaiting U.S. Government safety approval of this exciting new feature, and we assume they’re focusing similar lobbying on the Canadian government. 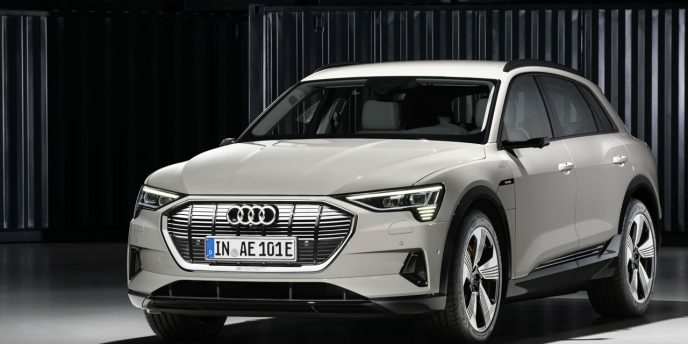 The e-tron 55 features seating for five adults, quattro electric all-wheel drive (one motor at each wheel), air suspension, and a towing capacity of 1,800 kg (4,000 pounds). The two electric motors accelerate the e-tron from 0-100 km/h in 5.7 seconds and reach a top speed of 200 km/h (124 mph). The Audi e-tron uses an innovative recuperation system encompassing both electric motors, to boost efficiency. With its estimated range of more than 400 km (250 miles), expect as much as 30 percent of the e-tron’s range to come from recovered energy, depending on the conditions, terrain and driving style. The e-tron can recover energy in two ways: by means of coasting recuperation when the driver releases the accelerator, or by means of braking recuperation by depressing the brake pedal. For charging on the go in the U.S., the e-tron will be supported by a nationwide charging network, “Powered by Electrify America.” By July 2019, this network will include nearly 500 fast-charging sites complete or under development throughout 40 states and 17 metro areas. Offering advanced charging, Electrify America’s chargers are capable of delivering up to 350kW. With the purchase of the e-tron, customers will receive 1,000 kWh of charging at Electrify America sites over four years of ownership. According to reports nothing similar has been finalized for Canadian customers, but sources within Audi Canada believe a similar deal may be offered. Take years of German engineering and production know how, and Audi’s capacity to produce e-tron on a large scale looks better than Tesla’s struggling efforts to meet consumer demand long before the first e-tron hits the street in Q2 of 2019. Ready to get yours? Visit audi.ca and place a $1,000 fully refundable deposit. In a market that’s constantly talking big about SUVs and simultaneously downplaying the popularity of traditional sedans, the Audi A3 has steadily made year over year gains. In fact, the recently revised model’s Canadian sales grew 5.3 percent from the close of 2016 to December 31, 2017, while deliveries are up an impressive 63 percent since 2014, the first full year that four-door sedan and convertible body styles were added to the mix and the conventionally powered first-generation five-door wagon/hatchback Sportback was dropped. To be clear, along with the A3 Sedan and A3 Cabriolet, Audi once again sells an A3 Sportback, albeit now dubbed A3 Sportback e-tron due to only being available in plug-in hybrid guise, while the A3 Sedan is also available with sportier S3 and RS 3 upgrades. Being that I haven’t driven any of these alternative versions in 2018 guise I’ll keep this review focused solely on the A3 Sedan, which once again found its way into my hands in mid-grade 2.0 TFSI Quattro Progressiv trim. Back to sales and the SUV phenomenon, the A3 was the only car in its subcompact luxury class to achieve positive growth last year, actually managing to pass right by the Mercedes-Benz CLA on its way to segment bestseller status. While this is great news for Audi, the surprising flip side to this scenario is a Q3 subcompact luxury SUV that’s losing ground to its competitors, with calendar year 2017 sales that were off by 3.5 percent in a Canadian new vehicle market that was up overall. Audi will want to remedy its entry-level SUV situation quickly. The A3 Sedan needs no such drastic attention, especially after receiving a significant mid-cycle upgrade for the 2017 model year. It therefore continues into 2018 unchanged, with its “horseshoe” grille still slightly larger and more angled than the one it replaced, the now standard HID headlamps slimmer with more sharply scalloped lower edges than the more conservative outgoing lenses, and its standard LED taillights still dazzling when lit up at night, while the refreshed A3 Sedan’s sharply detailed lower front and rear fascias continue forward unchanged as well. Last year’s redesigned standard and optional alloy wheels needed no fix either, my tester’s being a stunning set of machine-finished twinned five-spoke 18-inch alloys that looked as if they’d been upgraded to S Line sport trim, but such wasn’t the case at all. Really, despite standing out like a fully dressed premium four-door, my 2018 A3 Sedan 2.0 TFSI Quattro Progressiv tester was simply Audi’s least expensive model in its standard mid-range trim, nothing special. Or at least it was nothing special for an Audi. The German brand’s bold, sporty styling has helped sales steadily grow year over year since 2005, even making gains through the great recession. Specifically, Canadian Audi sales grew 17.9 percent last year, making 2017 the luxury brand’s strongest growth since 2014 that saw its sales expand by 19.5 percent over the previous year’s sales record. Other standout years include 2010 with a 26.7 percent increase over 2009, while even 2008, right smack dab in the middle of the financial crisis, saw Audi sell 22 percent more vehicles than 2007. That 10-year period witnessed Audi Canada sales grow by more than 288 percent, all because of making smart decisions like the A3 Sedan. The fully configurable Audi Virtual Cockpit 12.3-inch TFT primary instrument package was added to top-line Technik trim as part of last year’s update, while the car maintained its already well-received MMI infotainment system that continues to power up out of the dash-top to the oohs and ahs of passengers, so Audi is ahead of its rivals in one instance and about mid-pack with the other. Why just a middling classification for A3 infotainment? The 7.0-inch display’s diameter probably makes it a bit small in today’s bigger is better tablet-infused world, although it was certainly large enough for my requirements, and despite providing bright, beautiful colours, deep and rich contrast, crystal clarity and stimulating graphics, its lack of touch-capacitive control keeps it from earning top marks. Then again, the screen earns big points for its disappearing act, or rather the ability to eliminate its own distracting presence during night drives by hiding away in the same nook that brings it to life on startup. Audi recently upgraded the MMI Radio’s operating system to accept Apple CarPlay and Android Auto smartphone connectivity, but being that I use an Android-based phone and don’t like the latter system I found the standard interface more pleasing to look at and plenty easy to navigate through, and I’m not just talking about route guidance. Yes, Audi included its $1,950 Navigation package in my $36,100 Progressive trimmed test car, which added MMI Navigation plus to the centre display, as well as MMI Touch to the lower console, and a colour multi-information display (replacing a rather rudimentary looking monochromatic unit) to the otherwise analogue primary gauge cluster. I should be clear that my Progressive trimmed A3 Sedan tester was actually upgraded with Quattro all-wheel drive, so the starting price was pushed up to $40,900 before freight and fees, and I should also let you know that all manufacturer recommended prices are easy to find and perfectly accurate at CarCostCanada.com, the one-stop-shop that allows me to quickly source pricing, features, cost/markup info, available rebate details and more. Here you can see the base 2018 A3 Sedan Komfort starts at just $32,800, while the top-tier Technik hits the road at $45,300. The $4,800 difference from front-drive to the all-wheel Quattro drivetrain includes more than just rear-wheel motivation, by the way, the upgrade also featuring 34 more horsepower from 186 to 220 ponies, 37 additional lb-ft of torque from 221 to 258 foot pounds, and one less forward gear, from the FWD car’s brilliant seven-speed dual-clutch S tronic automated gearbox to the slightly less flashy yet still very good six-speed S tronic automatic transmission. Efficiency fans may also chagrin at the Quattro-equipped car’s lack of idle start/stop that helps to reduce the base model’s claimed fuel economy to just 9.1 L/100km in the city, 6.8 on the highway and 8.0 combined to a less miserly yet still thrifty 9.7, 7.5 and 8.7 respectively, but frowns turn to a smiles when factoring in the more formidable model’s 0.8-second gain from standstill to 100km/h, the FWD model performing the feat in a respectable 7.0 seconds compared to the Quattro’s much more entertaining 6.2 seconds. Both A3 trims benefit from highly responsive speed-sensitive rack and pinion steering and a wonderfully nimble fully independent chassis, the latter consisting of MacPherson struts with lower wishbones up front and a four-link suspension with separate springs and dampers in back, the setup combining for easy manageability and a nice comfortable ride through town, superb manoeuvrability on fast-paced windy back roads, and total stability at highway speeds up to 209 km/h (130 mph), but take note the Quattro system’s rear-drive mechanicals eat up trunk space, reducing available cargo capacity by 62 litres (2.2 cubic feet) to just 284 litres (10.0 cubic feet). At least Audi finishes the A3 Sedan’s trunk off nicely with a carpeted floor, sidewalls and under-lid, plus chromed tie-down rings at each corner, while it provides 60/40-split rear seatbacks to expand on its usefulness, with a handy centre pass-through for placing longer cargo like skis down the middle so that a duo of rear passengers can enjoy the more comfortable window seats. Also notable, the rear seat folding mechanisms feel much better made than average, while along with a spare tire Audi has organized some small cubbies below the cargo floor for stowing items like work gloves and rags, or possibly a little tool kit. Of course, other than the need to move around the cabin to take notes I spent the majority of my time in the A3 Sedan’s driver seat, which proved easy to set up thanks to exceptionally good ergonomics, and was therefore wonderfully comfortable and ideally positioned for optimal control. Backing out of my parking spot I immediately appreciated the dynamic guideline-assisted rearview camera system that relegates a third of the MMI display to active overhead graphics, which highlighted my car’s proximity to surrounding objects via colours that corresponded with the front and rear parking sensor’s audible beeps, hazard orange changing to bright red when coming dangerously close to scratching the A3’s lovely paintwork. My tester was finished in Ibis White, one of two standard colours that also include Brilliant Black, while Audi offers an octet of $800 metallic enhancements, with Cosmos Blue Metallic being the most interesting—the rest are white, silver and grey shades, plus vibrant Tango Red Metallic. Now that I’m talking features, on top of everything already mentioned, base Komfort trim includes 17-inch alloys, auto on/off headlights, aluminum doorsills, an electromechanical parking brake, leather upholstery, a powered driver’s seat with four-way power lumbar, heatable front seats, rain-sensing wipers, dual-zone auto climate control, a leather-wrapped multi-function steering wheel, 7.0-inch MMI infotainment, 180-watt 10-speaker AM/FM/CD audio with an aux plug, satellite radio, Bluetooth phone connectivity (without audio streaming! ), a large glass sunroof, an alarm, and more. On the safety front the A3 gets the expected ABS-enhanced four-wheel disc brakes with EBD and BA, plus traction and stability control, Pre-sense Basic crash response, and six airbags, which is good enough for five stars from the NHTSA in standard trim and Top Safety Pick status from the IIHS when its $1,050 LED Lighting package is added. Within the A3’s subcompact luxury class only BMW’s 2 Series achieves the latter IIHS rating, and being a two-door coupe or convertible it doesn’t directly compete. Upgrading to Progressiv trim provides Audi Drive Select with Comfort, Auto, Dynamic (sport) and Individual modes, the aforementioned 18-inch alloys, brighter high-gloss window surrounds, unique Mistral aluminum interior inlays, more aluminum trim, LED ambient cabin lighting, a powered front passenger seat, an auto-dimming rearview mirror with an integrated compass (that should really be standard in this class), Audi’s MMI music interface featuring Bluetooth audio streaming (ditto standard equipment), one more SD card reader slot, an extra USB charging port, the rearview camera with active guidelines mentioned earlier (I still can’t believe it’s not standard), and more. Options include a Premium package at $1,700 with the base car or $1,100 when added to Progressiv trim, the price difference due to only adding proximity keyless access with pushbutton ignition plus fore and aft parking sensors with the upgraded trim, being that the bright window surrounds and powered front seats are already standard. I’ve already noted the LED headlight upgrade and Navigation package, which means that only the $1,800 S line sport package remains, a worthwhile addition that features unique exterior styling, a separate set of 18-inch alloys, a sport suspension, S line doorsills, brushed aluminum interior trim, a flat-bottom steering wheel with paddles, sport seats, and a black headliner. I’d be tempted to go for the S Line sport package if this were my personal ride, and it would be difficult not to spend a little more to move up to Technik trim as well, which makes everything mentioned (other than the S Line package) standard, including the LED headlights and navigation, plus adds auto cornering headlight capability, special dynamic taillights, a heatable steering wheel, the aforementioned Virtual Cockpit, a brilliant sounding Bang & Olufsen audio system, Audi side assist to warn from approaching rear traffic, and more. Additionally, only Technik trim lets you add a $1,400 Technology package with Audi pre-sense front, Active Lane Assist, Adaptive Cruise Control with Stop and Go, plus High Beam Assist, the latter two well worth the price of admission for convenience sake, and the first two capable of saving life and limb. 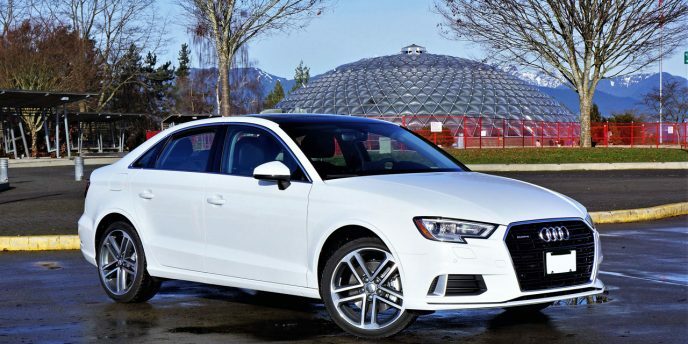 With pricing between $33k and $50k, plus features to justify any extra expense, it’s no wonder the A3 Sedan remains so popular. It delivers exactly what budget-oriented premium sport sedan buyers want, and looks fabulous no matter the trim. I expect Audi will remedy some of the base car’s shortcomings by making some optional items standard, but keep in mind that it’s priced well and includes leather, auto HVAC, a sunroof, etcetera in its most basic package, so splurge for Progressiv trim if an auto-dimming mirror, backup camera, and Bluetooth streaming are must-haves. Either way you’ll be well served in a 2018 Audi A3 Sedan.